Has time taken its toll on your skin? Do you have unsightly acne scars, stretch marks, or discoloration? Wrinkles and scars do not have to permanent. Microneedling is an innovative way to give a fresh look to your skin by encouraging the generation of new skin cells. Safe and effective, Microneedling revitalizes the skin by lifting and tightening facial tissues, reducing scaring, correcting fine lines, and improving surface textures. Microneedling is suitable for multiple applications and skin types. Microneedling rapidly creates a pattern of micro channels in the treatment area. These micro channels significantly increase the production of collagen and elastin to leave the skin smoother, fresher, and more uniform. Micro channels also create micro injuries which causes the body to send blood and growth factors to the area resulting in glowing, healthy skin. 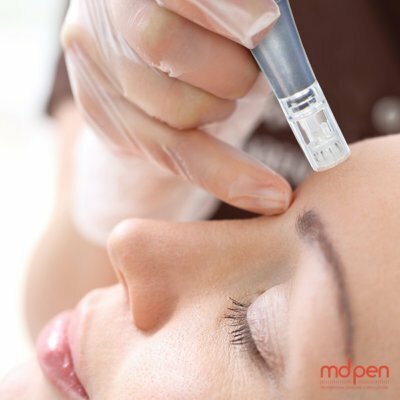 Microneedling also called Collagen Induction Therapy (CIT), involves using a tool called a dermapen with tiny needles at the end that make little holes or needle pricks in the top layers of skin. The little holes from the needles create “micro channels” that allow skin care products such as potent serums to penetrate and absorb into the deeper layers of skin to deliver more powerful results. These tiny pinpricks act as a bunch of mini injuries which kick skin into healing mode and stimulates collagen and elastin production. This process plumps skin and improves the appearance of fine lines, wrinkles, scars, and pores.